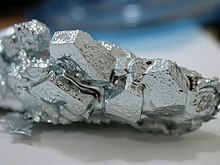 Gallium is a chemical element wi seembol Ga an atomic nummer 31. Elemental gallium disnae occur in free furm in naitur, but as the gallium(III) compoonds that is in trace amoonts in zinc ores an in bauxite. Gallium is a saft sillery metal, an elemental gallium is a brickle solit at law temperaturs. Gif it is held in the human haund lang eneuch, gallium will melt, syne it melts at the temperatur o aboot 29.76 °C (85.57 °F) (slichtly abuin ruim temperatur). The meltin pynt o gallium is uised as a temperatur reference pynt. The alloy galinstan (68.5% gallium, 21.5% indium, an 10% tin) haes the even lawer meltin pynt o −19 °C (−2 °F), weel ablo the freezin pynt o watter. Beginnin wi its discovery in 1875 throu the era o semiconductors, gallium wis uised primarily as an agent tae mak alloys that melt at law temperaturs. Then, gallium became uiseful in semiconductors, includin as a dopant. This page wis last eeditit on 16 Februar 2018, at 05:22.